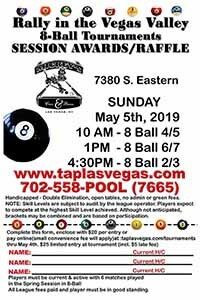 Singles 8-ball and 9-ball State Championship tournaments are complete and Our 2019 Champions have been crowned. They will be competing at TAP Nationals in Biloxi, Mississippi! 2019 Nationals - Biloxi, Mississippi! 2020 Nationals - Wichita, Kansas! 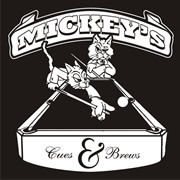 TAP IN newsletter - Spring 2018! Click here to read about this player statistic module and request your login. 1) Who's the Best where players are compared at a local level and/or all of TAP, United States and/or Canada! 2) Individual standings in the Scout Module. Players can see how they perform against all skill levels and/or against each individual skill levels. The more data entered, the more interesting and helpful the results are. Login IS NOT required for Who's the best in TAP Las Vegas? Who's the best in all of TAP League? Who has the most break and runs this year to date? Players can find this and more in PoolNet, our state of the art statistical reporting and handicap tool. To see "Who's The Best," select the option on the left sidebar (no login required). 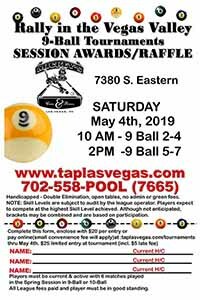 Leave it set to "All Territories" or select it and find "TAP Las Vegas" or whichever TAP league you want to view. Uncheck USA and/or Canada if you wish. The Start Date will default to one year prior to the date you are running the report. The Start Date cannot be any date before one year. Select a handicap and "Submit" to see Who's the Best!! LOGIN ID IS NOT REQUIRED TO "DISPLAY STANDINGS" (weekly stats) or "WHO'S THE BEST"
Watch the video below to learn about viewing your personal statistics (aka Scout Module) and read more below. A login is required to see these statistics. Click here to request a login ID and password to VIEW YOUR PERSONAL STATISITICS. Watch this short video, read below and then Login to PoolNet. The Member Scout (individual player statistics) provides the statistics detailed below. Select 8-ball, 9-ball or 10-ball. Select a date range or leave it blank to see your entire history. The Edit Personal Information provides players with the ability to update all of their contact information. The handicaps players see on both of these statistics modules are 100% statistically based on the input from the score sheets that are completed and input each week into PoolNet. There are 5 weighted categories that give players across the U.S. and Canada a very fair and equal handicap based on overall playing ability. Click here to read more. Match Closeness – defines the percentage of the match that you or your opponent has left when it ends. If the number is negative, it means what you have when your opponent wins. So -40% means you lost the match needing to win 40% of the games. So if you need 5 games to win, a -40% means you lost needed to win 2 more games. To view the schedules, you must have Adobe Reader. Click here to down load a FREE copy. click here for the newest version of Internet Explorer.